“Now what?” It’s a question asked of and by most recent college graduates. Alyssa Shriner is no exception, but the way she’s going about finding the answer is quite impressive. With a steady methodical approach, Alyssa takes one step at a time as she strives to make good choices in this new “real world” of adulthood. I haven’t known Alyssa long, but this truth about her became evident when she approached us about helping her buy her first car. It continues to hold true the more I get to know her. Before I get into that story, let me introduce you to Alyssa. Graduating from Florida Southern College this past December with a degree in Studio Art and Graphic Design, she’s at a bit of a crossroads as far as nailing down a career path. While she is interested in becoming an art teacher, her detail-oriented side is investigating a career as a pharmacy technician. While pharmaceuticals is a long way from art and design, I witnessed the “detailed” side of her personality as she navigated the used car buying process. It was impressive. Alyssa sent us VIN after VIN to get Andrew’s initial impressions of each car she was looking at. Those that seemed promising led her to talk to the seller. Dealing with these sellers was a mixed bag of experiences which eventually led her to her “new” car. These experiences in which the pre-purchase inspection found something “wrong enough” to eliminate some options made her grateful to have held onto her money for something more reliable that didn’t require significant repairs from the get-go. 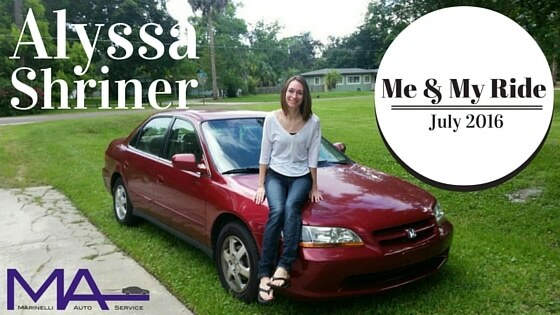 Alyssa engaged in the car-buying process in a way that we hope everyone will follow when investing in a new vehicle. Alyssa did find a great car eventually. It is a 2000 Honda Accord that had just over 51,000 miles on it on the date of purchase. The purchase price of the car left her room in her budget to tackle some of the issues found during the pre-purchase inspection. I have to point out here, that had Alyssa had a more generous budget, she would have had more cars to choose from and likely a less arduous process. However, her perseverance in the search and awareness in finding a car below her budget allowed room for those repairs. This was both commendable and wise. Now that Alyssa has her “perfect” car, she is enjoying getting around town to spend time with family and friends. More importantly, it allows her to get to her job at a local eatery, The Coop…that is, until she figures out her first post-college career move. She likes how the car drives (and she test drove many cars!) and can feel the difference the repairs have made in how it drives. Also, since she’s been driving the car for a few months now, she likes the familiarity with how it feels because she knows that if something goes wrong, she’ll likely be able to feel the difference. By the time Alyssa is ready to replace the Accord, she likely will have established herself in a career and will have more financial flexibility. For now, the only concern she has is simply her lack of knowledge about cars .She would like to gain more confidence in her ability to recognize when there is a problem that needs attention. Thankfully, her experience in talking with Andrew about car-buying advice and going through the pre-purchase inspection has given her a little of that confidence.